You would never know it by reading this morning’s Star Tribune, but there are a lot of great ways to celebrate Jazz Day (April 13), and Jazz Appreciation Month (April), in the Twin Cities. While the Strib only mentioned one jazz item in its weekly Big Gigs column (Kari Musil’s unveiling of new compositions with the Nova Jazz Orchestra at Sundin Hall, April 14), you need only look at the online Twin Cities Live Jazz Calendar or the Jazz Police website (or today’s Lead Sheet, right here on the blog) to find whatever floats your jazz boat. Among your choices, just for Jazz Day! · Internationally acclaimed pianist Bill Carrothers at the Artists Quarter (Friday and Saturday). Omitting this infrequent appearance by one of the most critically praised artists of modern jazz (and a Twin Cities native, at that) merely reinforces the criticism jazz fans hurl at the Strib every week. $12 cover at 9 pm. 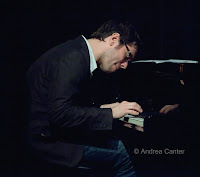 · Pianist Bryan Nichols and guitarist Dean Magraw at the Black Dog. No one does a better job of bringing cutting edge jazz and experimental music to appreciative audiences than Nathan Hanson and Brian Roessler, who curate the biweekly Community Pool/Deep End series at the Black Dog. 8 pm. With no cover (please feed the tip jar!) this may be the nation’s best jazz bargain. · Vocalists Rhonda Laurie and Bobbi Miller reprising their “Naughty Songs for Nice Girls” revue at Bryant Lake Bowl Theater (Friday). Jazz, standards, pop, burlesque, two fine voices will give you a lot of laughs and second thoughts. $10, 10 pm. · Pianist/bandleader George Maurer returns to the Dakota tonight with his infectious little big band, vocalists, and swinging good fun. 8 pm, $10. Go early and hear 92-year-old local sax titan Irv Williams with Peter Schimke and Billy Peterson reminding you that bebop still thrives, during Happy Hour. · Dynamic duo Joann Funk (piano and voice) and Jeff Brueske (bass) in their weekly (Friday and Saturday) serenade in the Lobby Bar of the St Paul Hotel. You can’t get much classier with no cover, and Joann will enliven your early evening with classics from Blosssom Dearie and Gershwin, and her own twists on more contemporary fare. 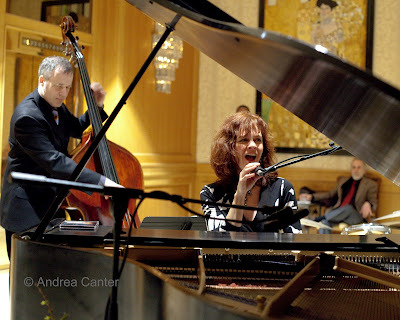 · Sublime swing, bop and more from the elegant Benny Weinbeck Trio in the lower level dining space of D’Amico’s Kitchen, inside Le Meridien/Chambers Hotel in downtown Minneapolis. Pianist Benny and his usual cohorts, Gordy Johnson on bass and Phil Hey on drums, keep a steady beat every Friday and Saturday night. No cover, 7:30-11:30 pm. · Becoming one of the most popular duos in town, vocalist Lee Engele and guitarist Reynold Philipsek chill out at the Wine Market in Mendota Heights. Songs from the Great American Songbook and others that should be, Lee’s engaging vocals and Reynold’s finger-popping guitar entertain in this inviting suburban hang. 5:30-7:30 pm, no cover. · A bit to the east, the Graydon Peterson Quartet at Shanghai Bistro in Hudson, WI. Long a coveted sideman, bassist Graydon assembled this band about six months ago and offers a welcome creative alternative to the pop and standards most often on restaurant and bar schedules. With Adam Meckler on trumpet, Vinnie Rose on guitar, and Adrian Suarez on drums. 6:30-9:30 pm, no cover. And if you decide to just stay home and celebrate jazz in your own sweet way, take some time to read the “jazz day” blogs, celebrating local communities, on the Jazz Journalists Association “Blogathon” site!